An Introduction to "Waste Ink"
If you already know about waste ink, "Service Required", etc.. you can skip to the end. For anyone discovering this page and the "Service Required" error for the first time, this guide will help you towards a solution. The most common error message that customers receive is "Parts inside the printer have reached the end of their Service Life". You are then directed to read your manual which, unfortunately, doesn't tell you anything. This lack of real information is probably the reason you are reading this in the first place. Your printer contains the equivalent of a nappy or diaper pad which is used to soak up any ink waste. This waste is generated during the various maintenance routines your printer requires to keep it functioning. As you'd expect, the pads can only absorb so much ink before they reach saturation point. The printer does not sense the level of ink but instead keeps track using an internal counter. This counter is sometimes known as the "protection" or "waste ink" counter and is controlled by a relatively complex equation in the printer firmware. To fix the issue you need to tackle two things. These are usually a piece of software that can be quite limited in function or complex enough to be provided to technicians for use in service centres, etc... In the context of the waste ink problem, they provide you with a means to reset the waste ink counter. Replacing the pads in some printers depends entirely on the manufacturer and design of the printer. Some designs (particular Epson inkjets) require an intimate knowledge of the printer assembly. In addition, attempts to remove, clean and/or replace the pads often renders the printer un-usable. It is for this reason that external tanks have been developed as a simpler solution. As noted above, this solution is preferred by most printer owners as a much simpler solution. It works by redirecting almost all ink waste into an external tank, bypassing the pads in the printer. 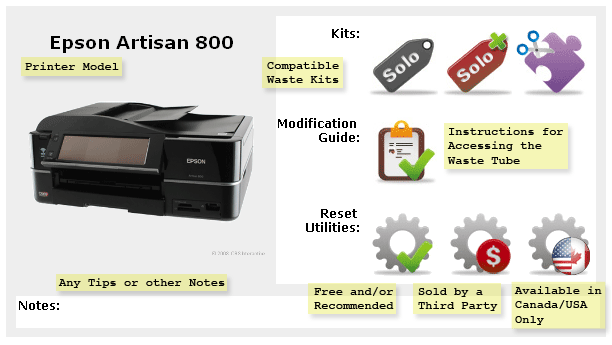 Of particular benefit is the the fact that any future "service required" issues will only require a reset while you dispose of the ink waste itself without taking the printer apart. A few customers have admitted that they have opted to ignore the waste ink after resetting the printer waste counter and then suffered the consequences later. You can ignore the waste for a short period of time but you have to remember that the waste pads have a finite capacity and will eventually leak. Anyone who has researched this problem before will know that locating information for some printers is easier than others. Obviously we can provide the waste kits to suit your printer but with so many different designs, incompatible reset utilities, etc... finding the rest is a job that can take hours. The screenshot (Fig #1) below shows how the information is provided. This information is kept updated, especially for new models, so it is worth checking regularly for any new information. If you have any problems, further questions or the information relating to your printer is incomplete please don't hesitate to contact me and I'll do everything I can to help. This guide has been intended as an introduction to the OctoInkjet waste ink kits but there are a number of other product available so by all means check the rest of the store for other useful tool, parts and materials.